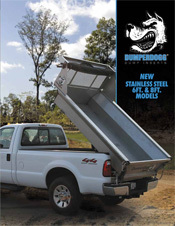 DumperDogg by Buyers are available in steel or polymer. They also fit most beds 8 feet and 6 feet. 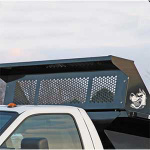 Cab guards, wall extensions and roll tarp kits are available. Get the quality you expect from Buyer's in a dump bed that's built to last. Turn that pick-up into a dump truck at a price you can't beat! Steel: least expensive, sturdy, best for landscaping in warm climates; steel eventually rusts. Stainless steel: more expensive than steel but won’t rust. Polymer: most expensive, never rusts, durable flexible; best option for year-round work. Zequip carries 6 and 8-foot steel, stainless steel and polymer beds that can mount a spreader, power up and down, carry up to 6,000 lbs and dump at 45 degrees. Looking for a low cost solution for a dump body for your pick-up? Give our staff a call today for the best pricing on all our dump beds and accessories.